In March I relocated the art therapy portion of my practice to Cloud Tree Studios and Gallery in east Austin. More on that later! This past month I have been working on a new series of birds in mixed media on paper. 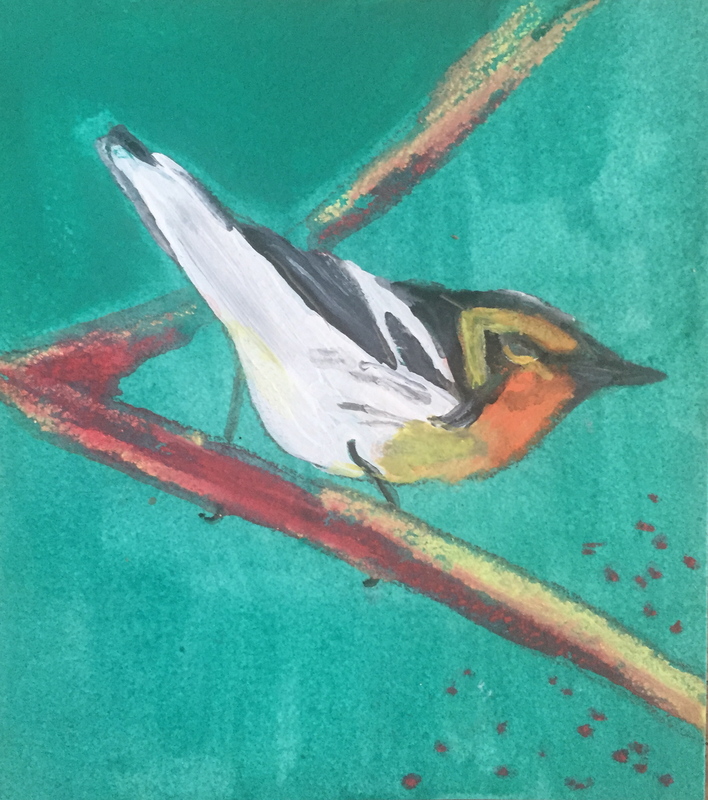 Having been an active bird watcher over 15 years, coupled with my interest in migrating warblers (many trips to High Island, Texas over the years), this seems to be the next natural progression for a series of paintings. I am preparing a collection for the East Austin Studio Tour in November along with a limited number prints that will be available. The Blackburnian Warbler is one of my favorites. In April of 2004 I saw my first one in the willows at Anahuac National Wilflife Refuge in a rainstorm. I saw another in April of 2006 on the cul-de-sac near my South Austin home. They love pecan tree tassles when coming through Austin and especially after being grounded in an overnight rainstorm. The Blackburnian nests in mixed coniferous woods in the eastern parts of the United States, where many warblers raise young in the spring. Happy Painting and Birding Yall. Be Well!